Kyabje Lama Zopa Rinpoche gave these teachings during a Medicine Buddha retreat held at Land of Medicine Buddha in Soquel, California, from October 26 to November 17, 2001. Edited by Ven. Ailsa Cameron, this book covers an amazing range of topics. 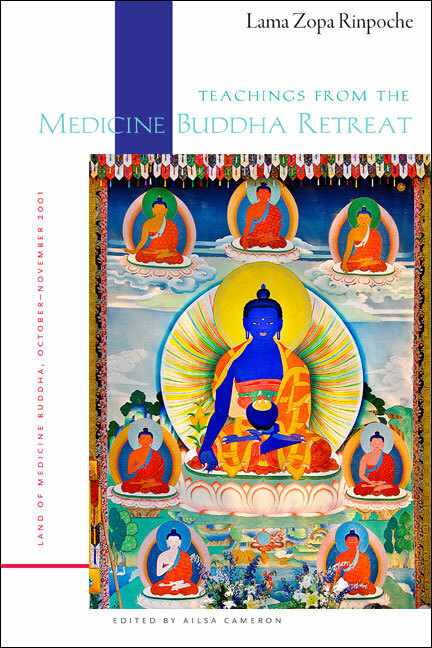 "Teachings From the Medicine Buddha Retreat is a nearly complete record of the teachings given by Lama Zopa Rinpoche during a twenty-five day Medicine Buddha retreat in the fall of 2001. The sections are short, on topics such as making offerings to the buddhas and the nature of mind. The retreat was held less than two months after the 9/11 attacks, and Lama Zopa's teachings are full of references to terrorism, war, Iraq, and Afghanistan. "The book is not meant as a coherent presentation on any particular topic; however, one is rewarded by just opening it and reading anywhere. Lama Zopa is a clear and effective teacher, and his stories are endlessly entertaining and inspiring." Order a print copy by clicking the Add to Cart button on this page. You can also read excerpts from this book online and listen to original audio recordings, or visit your favorite ebook vendor using the links below. LYWA Members can download the ebook for free from the Members Area. Special price for LYWA customers: Teachings From the Medicine Buddha Retreat retails at US$20 per copy but we are offering this book at the special price of $15 to customers who purchase it directly from us.